BUDGET FAMILY ET PET PARFAIT! A / C, piscine, spacieux cour clôturée. Salle de bains familiale rénovée avec baignoire et douche séparée et toilettes. L'ambiance décontractée de Coolum le rend populaire toute l'année. Frais supplémentaires: Ménage, draps / serviettes et les invités supplémentaires. Fournis: oreillers, couettes, couvertures de coton. Mattress & Pillow Protectors. CHIENS (Calme et bien formés) sont les bienvenues - BYO LITERIE. AUTORISÉE INDOORS avec les propriétaires présents. Pourquoi ne pas reporter vos dates à une heure plus convenable? Perfect holiday accommodation for all the family, pets included. We thought the home away from home was very well set up. Nice clean well set out property. Pool very clean and a few dips taken even though a little chilly. Dogs safe and secure and enough room to play and get out of sun and rain. Dog welcome treats a nice gesture. Foxtel not working - even though attempts by owner were made to get it working, but no big issue for us as we were there for the sunshine coast snd its beaches and the Mt Coolum walk and neither disappointed. Very clean, all amenities that you need for a short or long stay. Pool great too! We were very grateful for being able to secure our booking at short notice - the process was very streamlined. The property itself is great and Louise definitely goes the extra mile to ensure you and your pets are warmly welcomed. Located in a handy spot too - close to beach, shops etc. It's never easy finding a place that will allow pets. Lanui would be up there with one of the best I've stayed at. Stumers creek and shops just down the road all added to the experience..thank you. Lovely and clean, pool was great! 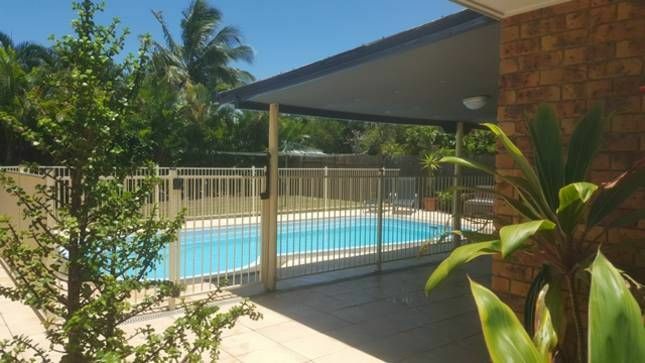 We had a lovely long weekend, hot so the pool and air con got well used! It was a bit of a walk to the beach,clubs and restaurants, but the dogs loved it! The Austar kept turning off,said no service, that was a bit annoying, but we weren't home much anyway! Recommend the Surf club for a drink on the verandah watching the sunset!!! Very nice basic accommodation for both people and dogs. Close enough to walk to beach and shops. . The outdoor area was very good although seating could have been a bit more comfortable. Major problem was unable to access foxtel. We realy like Coolum and be happy to stay at 'Lanui'again with the two of us and our two dogs. We had a great time at this property lovely quiet street plenty of walking and day trips out.